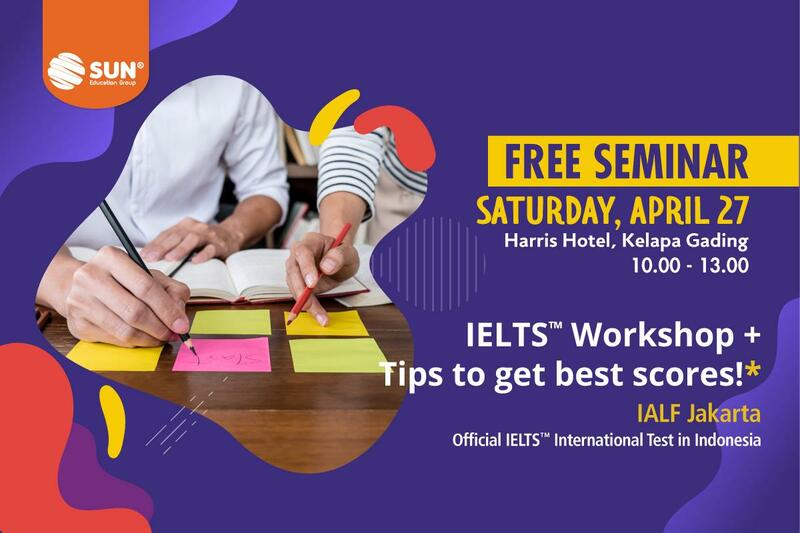 This free workshop combines important information about IELTS with practical ways to prepare for the test. Our experts will explain the structure and procedures for taking the test and how your result will help you to apply to universities at home and abroad. In addition, our IELTS preparation course teacher will share exam preparation tips and hints. SUN English is the right place for you to improve your English and to take the preparation for the IELTS™ and TOEFL® International Test. You will get a different learning experience by joining SUN English with varied and up-to-date programs. Currently, SUN English has Specialization Program for preparation of IELTS™ or TOEFL®iBT and TOEFL®PBT International Test. In addition, there are several other programs that have already been developed, namely: Academic Writing, Business English (e-mailing, presenting, negotiating, telephoning, socializing, meeting), English for Specific Purpose and General English. They are available to meet your needs.SUN English also provides English language training programs for companies, “In-Company Training” as well as Intracurricular and Extracurricular programs that are to be held in junior high school or senior high school.